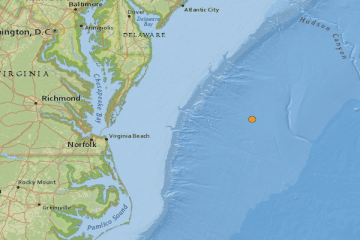 UPDATE: Was there really an earthquake off Virginia Beach? Tuesday’s magnitude 4.6 earthquake off the Virginia coast may not have been a true temblor at all. There are no fault lines or tectonic plates near the quake’s epicenter, recorded at 6:30 p.m. 162 miles east of Virginia Beach. The U.S. Geological Survey on Wednesday didn’t yet have enough information to “characterize it as an earthquake,” said USGS geophysicist Julie Dutton. Yesterday’s incident did not trigger any tsunami watches or warnings for the coast, though underwater landslides are known to cause tsunami waves. Due to the federal government shutdown, the USGS Earthquake Center is working with limited resources, slowing research into the event. The USGS did downgrade the quake’s strength slightly, from a magnitude 4.7 to a 4.6. Whatever its origins, Dutton called it “a sizeable quake,” in an area not known for seismic activity. “It’s rare to have earthquakes off the coast, but it’s not completely unheard of,” she said. The USGS recorded more than 180 reports from people who felt the rumble Tuesday, mainly along the coast from south New Jersey to the Outer Banks. Earthquakes along the East Coast aren’t as frequent as those west of the Rocky Mountains, but they are felt over a much wider geographic area. Bill, the booms you hear are Blackbeards’ cannons. Now if someone can add what the earliest record of this is that would be cool! I didn’t feel anything. Grandy NC. Didn’t feel it where I was on obx at all . I live about a mile from Buckroe Beach and I felt something but didn’t say anything because my husband would think I was crazy. Just seeing this article today. I feel better know there was some kind of tremor. Did anyone notice the oceanfront beach yesterday? What I saw was a clean wash from toe of dune out to the water as far as I could see North and South. Something happened to cause that event. Did not feel a thing and did not realize this supposedly happened. We didn’t feel it we live in Virginia Beach. Any fracking going on up there? Living in an OBX home on pilings, a “tremblor” is felt every time a truck goes by or the wind gusts up over 40 knots. After a while, these events don’t stick in memory and no, I don’t remember anything unusual about 6:30 pm Tuesday. Felt it here for sure.. Felt it in Hegins, PA.